Players who commit a foul to deny a goalscoring opportunity will no longer automatically be sent off, football's rule-making body has confirmed. 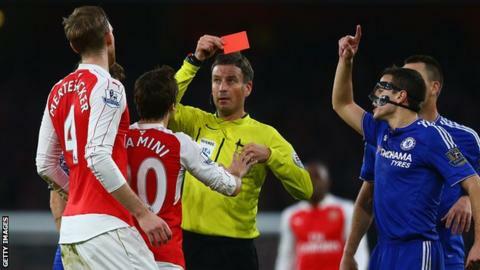 The previous 'triple-punishment' rule required a red card - and therefore a suspension - as well as the award of a penalty under those circumstances. However, players committing accidental fouls that deny a goalscoring chance will now be cautioned instead. But deliberate fouls will still incur a red card. Those include holding, pulling or pushing, not playing the ball, serious foul play, violent conduct or deliberate handball in order to deny a goalscoring opportunity. The change has been ratified by the International Football Association Board (IFAB) - a body made up of the four British football associations and Fifa - which decides on changes to the Laws of the Game. It follows a comprehensive, 18-month review, led by former Premier League referee David Elleray. Meanwhile, the IFAB has selected the Italian Football Federation to carry out a new trial of video replays. The technology will be used to help referees decide whether a goal has been scored, whether a penalty should be awarded, whether a player should be sent off, or in cases of mistaken identity. Italian Football Federation president Carlo Tavecchio said: "We were among the first supporters of using technology on the pitch and we believe we have everything required to offer our contribution to this important experiment." Tests initially will be in private before moving to a live pilot phase with replay assistance by the 2017-18 season at the latest. Have you added the new Top Story alerts in the BBC Sport app? Simply head to the menu in the app - and don't forget you can also add score alerts your football team and more.